Select a player. Type the first few letters of the player's last name, ID#, or use the ARROW keys. Double-click the player or press ENTER to see the player's “Tournament Info” form. Team number the golfer will play on. 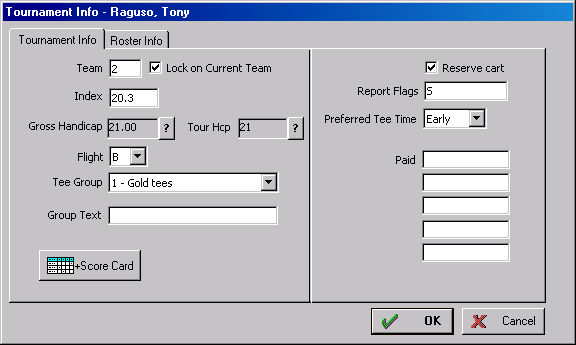 You can type the team number the player will be on, but it’s easier to drag and drop a golfer to the correct team. Drag the icon to the left of each player’s name and drop it on whichever team you wish him\her to be on. Note: You only need to assign teams if it is a “pick your partners” tournament. TM has the capability to build teams automatically in seconds. See Building Teams for more info. Player’s index. If you want TM to calculate the player’s handicap from his\her index, make sure Use player’s INDEX to calculate his\her handicap is marked on the Tournament Parameters form. See Tournament Parameters for more info. Tip: Click the ? button next to the gross handicap and TM will show you exactly how it was calculated. %Allowance is the handicap percent % allowance set in Tournament Parameters. Handicap adjustment is the adjustment to player’s handicaps set in Tournament Parameters. Tip: Click the ? button next to the tournament handicap and TM will show you exactly how it was calculated. The flight may be set A to Z. Flights are used to pair players and\or flight tournament results. TM can automatically calculate flights for you in each particular tournament. See Setting Flights. Tee group player is in. Mark if you need to reserve a cart for this player. Indicates when a golfer prefers to play, early, middle, late, or no preference. The report flag can be used to include\exclude players from any player reports. The letters A-Z and numbers 0-9 can be entered. Each player can have up to 12 flags (characters) in the report flag field. Tip: You could mark a player with an "S" in his\her report flag. When you print the Skins Report, instruct TM to only include players with a "S" in the report flag in the skins report. The report flags also allow for multiple selection criteria. For example, assume you have some players that wish to participate in Gross skins, some in Net skins, and others in both. You could mark the report flags with a G for gross skins, an N for net, and a GN for both. When you print the skins report you can instruct TM to include only players with a G in reports flag on the Gross Skins and an N in reports flag for the Net Skins report. 5 extra fields are provided to track any additional information you need. Tip: To change values for multiple players, highlight the players you wish to change the value for. Click the Edit button. Type in the appropriate values\info and click OK. All players will now have this value\info.